Every year Portsmouth Historic Dockyard have the Festival of Christmas, it is the biggest gathering of Christmas Markets on the south coast. Christmas markets are fun, and this one is made better because it has a Victorian element to it. The Historic Dockyard is a great place for this as the buildings in the area go back many years. The local community and enthusiast come out in Victorian costume and provide entertainment throughout the day. The opportunity to indulge in some Victorian fare is great, mulled wine or cider, hot chestnuts and many others. I suppose some of the best aspects of the day is interacting with the characters, chimney sweeps, military, vagabonds, pick pockets and of course the street and brothel ladies. A pair of buxom ladies offered to take my son for free as he looked so fresh, over the day he was approached a few times, one lady even offered to teach him the ways of life…. The ticket for the day, gets you in the dockyard and you have access to all the main attractions, HMS Victory, HMS Warrior, Mary Rose and the historic museums. If you are will to queue, its worth it, as there is always something to keep you entertained while you wait. Overall its a great day out, some bargains can be found in the markets, whether it is food or goods. However, be warned, it gets very crowded and can be frustrating, some goods are over priced compared to general street markets due to the captive audience. Food is available, but over priced for what it is; if necessary take a picnic with you, there are plenty of places to sit down and eat. If you haven’t been before, it is worth it for the experience, the street entertainers are great, and you get the chance to see what Portsmouth used to be like in the past. 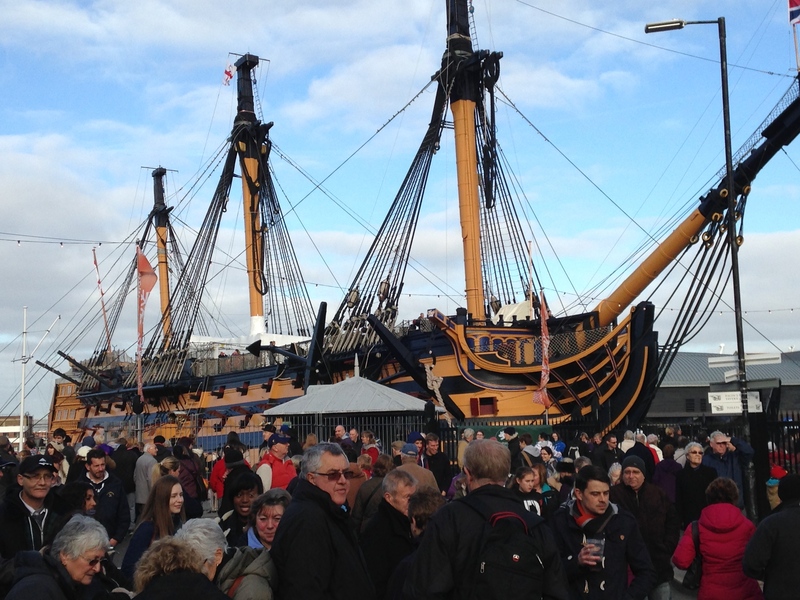 The event usually takes place the last weekend of November, put a reminder in your calendar and take a gander on down to Portsmouth’s Historic Dockyard to start you Christmas festivities.